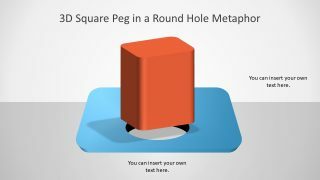 The 3D Square Peg Round Circle Metaphor is the concept presentation for business and personal experiences. 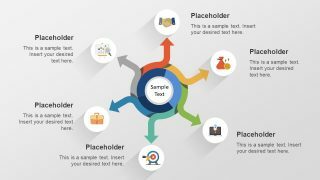 The round and square pegs created as shapes in PowerPoint, can represent the company’s core abilities. It can also portray the uniqueness of a person and their struggle to fit into the society. 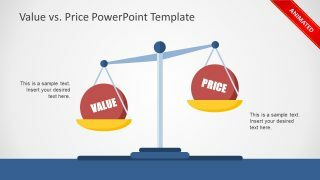 It is an exceptional PowerPoint template suitable for socio-economical and business study presentations. 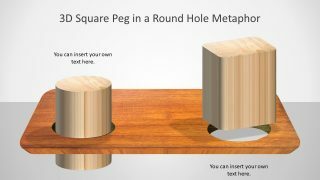 The template 3D shapes of square pegs and round circle is a visual presentation for metaphor in PowerPoint. The 5 slides of 3D blocks contain several colorful and classic pegs in the hole,designed with the real game look and feel.. For example, a blue board layout with a yellow cylinder shape and red square block. The pegs game metaphor is originally from moral philosophy study by Sydney Smith. The theory explains that it is unlikely for pieces to fit exactly in their respective holes. The 3D Square Peg Round Circle Metaphor offers an incredible animated 3D shapes slide layout. It shows the simple, yet incredible movement of the square peg over the round circle hole. 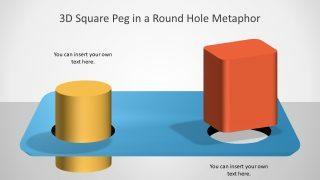 The animation illustrates the concept of the peg bouncing back in reaction to not fitting in the round hole. 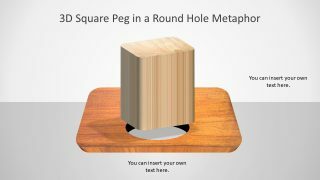 The metaphor PowerPoint concept of a square peg explains, that it is impossible for the square to fit in withing round circle hole. But, in the actual game, the player needs to find the correct whole that matches the surface of the solid body.. This shows that the business, or an individual ,needs to make decision to reach the desired position. 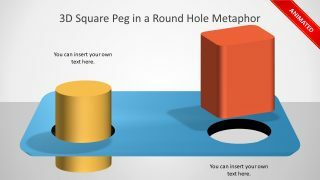 The 3D PowerPoint presentation of square peg and round circle metaphor is also an adversity strategy concept. The idea of fitting the square pegs into the round hole is the 3D illustration of success. 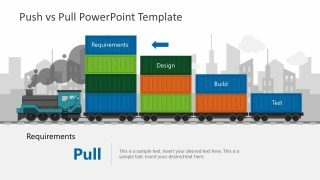 The 3D square peg shapes of PowerPoint with round circle holes are editable slides. And, 3D in PowerPoint template has an interesting layout of wooden peg blocks and board. 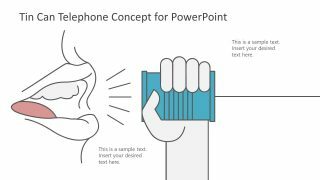 The PowerPoint provides quick solutions to personalize these slides. For example, the recolor, animations, and change in size etc.